As usual here are some download links for the app and the source files. Note that the application is now released under the GPL v3 license. If you’re a developer you might find it easiest to visit the GitHub repository. GitHub repository for the Euclidean Pattern Generator. All OSC messages are sent to ‘localhost’ on a port number you can specify yourself. In the top part of the application I added a text input labelled ‘OSC Port’. Here you can enter the port number of the receiving OSC server you want to send the OSC messages to. Because there is a choice now between MIDI and OSC I added checkboxes ‘Send OSC’ and ‘Send MIDI’. Only when these are checked OSC and / or MIDI messages will actually be sent. The receiving OSC application is able to identify which pattern sent the message if an address for the pattern is entered. In the pattern’s MIDI / OSC Settings panel there is a new text input field labelled ‘OSC Address’. This field is automatically filled with a default address ‘/eu/patternX’ where ‘X’ is a number that is auto-increased with each new created pattern. Of course you can use your own preferred address naming scheme as well. Here is a video that demonstrates sending OSC messages from the application to a Pure Data patch. Next to the Open Sound Control support there are a number of other new features, some of which were requested by users in comments on the previous version. Step duration (quantization) from 4 beats (one 4/4 measure) to 1/8 beat (1/32 note). Tempo maximum increased to 300 BPM. Pattern length up to 64 steps. The pattern grows in size to accommodate the number of step circles. Patterns can be named. New text input Pattern name in the pattern’s Other Settings panel. Whatever is typed here appears under the pattern graphic. When there are a lot of patterns in a project it’s easy to lose track of which pattern does what, so now you can name them ‘kick’, ‘snare’ etc. ‘All Notes Off’ button to kill hanging notes. This sends an ‘All Notes Off’ MIDI Channel Mode Message to each channel. All Notes Off is actually MIDI CC #123 with value 0 (see the MIDI specification). New patterns start with velocity 10 (handy in live situations where you don’t want a new pattern to come in at full volume). Preferences: Several settings are automatically stored and recalled the next time you open the application. MIDI enabled and MIDI Out port. OSC enabled and OSC port number. Last used directory to open or save a project. And lastly, not really a new feature, but ‘behind the scenes’ the user interface now uses SwiXML, a layout engine that uses XML files to define an interface built with Java Swing components. This makes the interface much more flexible and easier to maintain for future changes. In the next version I’ll add MIDI input and I hope it will be possible to get the app to synchronize to external MIDI clock. That would be cool. And I’d like to add triplets to the quantization options. For even more unusual polyrhythms. I just happened upon this page, this generator is AWESOME! I see a huge possibility for something like this to be used in a rock / pop setting, with the ability to assign different patterns to the outputs of drum samplers such as EZDrummer, Addictive Drums, Steven Slate. Fantastic work, I hope it continues to get some occasional attention. Take care and be well! Just came across this – VERY cool. Bravo Mr. Wouter. Was curious if you had an updated version with MIDI input and the ability to sync to an external MIDI clock. Really enjoying this so far, but the fun is yet to begin! great Software.. really appreciate it! But there’s a bug it seems.. the app does not quit.. apple+Q does not work. I always have to force it to quit.. but anyway.. that’s a nitpick..
Great device, thanks for all your work. Any update now re: midi clock? This is awesome! Thanks for source! Haha. Having some great late night fun with this. the next pattern does not need another note on the “one”. Very cool stuff. I’ve been playing around in this area myself lately. Mostly just coding in Node.js and pumping midi to Garage Band. Hopefully this’ll lead to some sort of UI as well. It may be of use to someone..
Hi, this app looks great and has really inspired me to try it out. Unfortunately I can’t seem to get it to work for me. The IAC bus is not showing up. Can anybody help me out? Also I am have to force quit the program. I’m on a iMac running Ableton 8.2.1 on Snow Leopard. Nice program, thumbs up for idea. I played around a bit and noticed that you could get fantastic live percussion feeling while manually sequencing actual Euclidean Rhythm settings. Could you think about adding OSC control for rhythm parameters? thank you for developing such a great application! Thank you very much for this software, this is the best implementation of the euclidean stuff. I have made an upload button (old version), now i am able to upload pattern setting to the machinedrum via sysex :) really beta-state/testing but it is working! Send me an e-mail if you would like to test/integrate. @Nils: Yes, accents, great idea. Hadn’t thought of it, but that shouldn’t be too hard. Another thing for the next update. B.T.W. I have been too busy with work and freelance projects. That’s why there haven’t been any updates. But this isn’t a forgotten project. I hope to continue with it soon. One more thing: An accent feature would be really wonderful! This is an excellent program, and i had hours of fun with it! 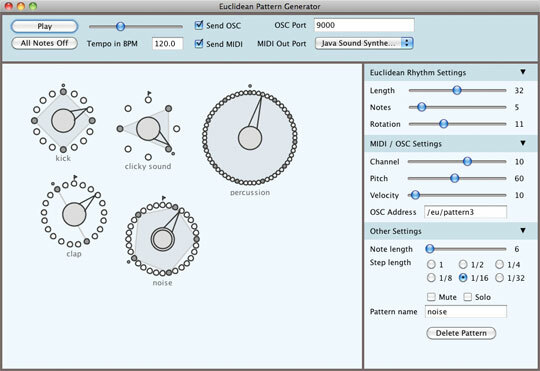 It would be great to see this program evolve into something like a softsequencer or even arpeggiator thing. The timing issues i have are the only thing that stops me from using it more. Again, thanks for that great program! @Joel: Thanks! You can already choose the note a pattern sends; with the MIDI settings slider. The pitch slider sets the note number. It’s 60 (or C3) by default, but spans the full 128 MIDI notes. First of all thank you so much for this tool, it’s very usefull to search drums line. Even if it’s not clock sync, just move the note after recording. One question, it would be great to choose which note to send to the sequencer over the midi bus, not only C3, if it’s possible. Dear Wouter, regarding the jitter, probably same as anybody else might hear or experience it, I use here XP with Java SE Runtime Environment (build 1.6.0_18-b07). I experienced also in other java midi applications the midi timing is not really good at all, here my other example: MidiSwing. On the other hand if you know ANY java midi application with a solid timing, I would like to test it also, just to know that it can be done also in a different way. Anyway to hear the jitter you need to know other systems with better timing, so you will FEEL the difference immediately. @Tony: Is the drift or jitter in the clock very noticeable for you? I can’t really hear it when I listen. Anyway, MIDI in and MIDI clock sync is coming soon. 2. it is almost impossible to record in sync to the daw’s measures. So the result is not sooo convincing, still cool, but could be even cooler! Thanks! this is awesome work. the updates are perfect. many thanks.